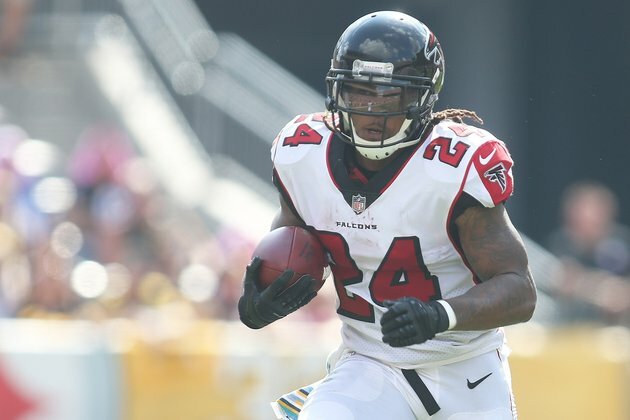 Running back Devonta Freeman of the Atlanta Falcons, who missed three games because of a knee injury, was back on the injury report on Wednesday, when he missed practice because of a foot injury. Freeman, who injured his right knee in the Falcons' opener and did not play again until a loss to the Pittsburgh Steelers on Sunday, has a bone contusion in the foot according to the NFL Network, but he did some individual work on the side while his teammates practiced. Against the Steelers, Freeman had 41 total yards on 10 touches while taking part in 28 snaps, the most of any Falcons running back. Tevin Coleman recorded 26 snaps, while Ito Smith tallied 11. Freeman has 14 carries for 68 yards, a 4.9-yard average, when he has been able to play this season, but has not scored a touchdown. He also has five receptions for 23 yards. The Falcons (1-4) play the Tampa Bay Buccaneers this weekend, and obviously hope Freeman is able to play against the NFL's fourth-ranked rushing defense. Defensive end Grady Jarrett (ankle) also sat out the Falcons' practice, while receiver Mohamed Sanu (hip), cornerback Justin bethel (knee) and defensive end Derrick Shelby (groin) participated on a limited basis.